Long before World War II, Adolf Hitler was laying the groundwork for what promised to be one of the most extensive art heists Europe had ever known. An amateur painter and frustrated art student (his applications to the Academy of Fine Arts, Vienna, had twice been rejected), Hitler nurtured a dark fantasy: The Führermuseum. It would be the epicenter of European art and culture, a showplace for a premiere art collection he had been methodically assembling since the 1920s. Throughout the prewar years, Hitler had assigned German art scholars to scour Europe's great museums and collections, cataloguing coveted items into an ambitious wish list: paintings, statuary, tapestries, ancient artifacts, and even religious relics. By 1938, German and Austrian Jews were seeing their art collections confiscated—disappearing into a secret, and growing, stash. According to German war records, Hitler had ordered the search of "lodges, libraries, and archives" for "cultural properties." Entartete Kunst—work by artists Hitler considered "degenerates"—which included German expressionists, cubists, impressionists, and nearly all others working in modern styles—was to be destroyed. Under the cover of war, the Nazis launched one of the most sweeping, premeditated looting operations in modern military history. By some estimates, tens of thousand of pieces of artwork were plundered—perhaps as much as 20 percent of Europe's private art treasures. University of Oregon graduate Gordon W. Gilkey, MFA '36, was among a community of American artists warily watching the disaster unfold from afar, as precious artifacts embodying history, culture, and religion—the very touchstones of a civilization—began to vanish. A towering, affable fellow known as much for his garrulous, down-home charm as for his sharp business acumen and unyielding gifts of persuasion, Gilkey was a man who was used to getting things done. He was born in 1912 on his grandfather's Oregon homestead near Scio, a patchwork of rolling farmland blanketing the Cascade foothills. A rancher's son, Gilkey was raised to understand the rewards of hard work. His artistic talent was evident even as a child—the boy was routinely scolded for spending more time drawing than studying. When he enrolled in high school in nearby Albany, he was named art editor of both the student newspaper and the yearbook. With little money to pay for college during the Great Depression, he chose to attend Albany College (later known as Lewis and Clark College). "I didn't have enough money to leave town," Gilkey quipped in an oral history recorded at Oregon State University in 1980 (and referenced throughout this article). He earned his way through school by clearing land, driving horse-drawn thrashers during harvest, and serving as a forest lookout high atop Crescent Mountain near Clear Lake, a job that provided long, quiet hours for sketching. By 1933, Gilkey had enrolled in the University of Oregon's master of fine arts program, intent on studying drawing and painting. He credited his next-door neighbor, UO architecture professor Eyler Brown '16, with changing his mind, introducing him to the wonders of printmaking. Soon after returning from a sabbatical to study European printmaking, Brown invited Gilkey to help him build an etching press in the School of Architecture and Allied Arts. It was only natural that the young artist would want to dabble in the medium. With the help of Professor Maude Kerns '99, who had a press in her art education lab, Gilkey experimented with a drypoint technique to scratch his first metal plates, each stroke chiseling deep within him a passion for printmaking that would never fade. Though printmaking was dismissed by some as the overlooked stepchild of the fine art world—relatively inexpensive to make and frequently produced in large batches—Gilkey was captivated by an art form he considered both versatile and highly accessible. This was art for Everyman. Gilkey soon developed a foolproof system for building his own art collection: whenever he ran prints for another artist, he would ask to keep one for himself. When he met new artists, he would also invite them to trade prints. To Gilkey, collecting was more than a casual hobby. It became part of an obsessive educational journey, each print offering an opportunity for in-depth study. "Brief looking is not learning," he once observed. In 1936, Gilkey was awarded the UO's first master of fine arts degree in printmaking. For his graduate thesis, he created a volume of original etchings documenting construction of the then-new University of Oregon Library. Ever resourceful, Gilkey had secured WPA funding to purchase the paper, inks, and plates necessary to produce his work, which was turned into a book. Armed with the UO etchings, Gilkey made his way to New York, where Vivian Malone '34, his high school sweetheart and a fellow UO grad, was studying violin at the Juilliard School (they married in 1938). He arrived to find a city abuzz with preparations to host the 1939 World's Fair. Promoted with the tagline "Dawn of a New Day," the futuristic exposition would attract some 44 million people during its run. Within months of arriving, Gilkey was seeking out fair officials with an ambitious pitch: Why not publish a portfolio depicting the architecture of the World's Fair—something similar to his UO project? Gilkey won the nod as the official artist of the 1939 World's Fair, although he would have to scrape together his own funding, which he accomplished with the backing of publishing giant Charles Scribner. It proved a pivotal project: Created over the course of the next two years (1937–39), his etchings documenting the construction and completion of fair buildings would eventually become his ticket to perhaps the greatest treasure hunt in human history. "What not to blow up"
As excitement grew around the World's Fair, Gilkey's companion portfolio was gathering its own keen interest, and from unexpected quarters. President Franklin Roosevelt "was involved with the Federal Building at the fair," Gilkey said, and "wanted to see how things were coming." When the president asked for some of the original prints, the artist complied. The etchings would eventually find their way into the Franklin D. Roosevelt Presidential Library, as well as the Metropolitan Museum of Art and museums in London, Brussels, The Hague, and Paris. But even as crowds began flocking to the 1939 World's Fair that summer, German tanks were rumbling into Poland. As the Nazis advanced, Gilkey cringed at the potential for collateral damage—threats to not only Europe's great museums, but its historic architecture and bridges as well. Leveraging his connection to Roosevelt, he offered a bold suggestion: If the United States entered the war in Europe, the president should employ art experts along with his troops. "We ought to send specialists to tell them what not to blow up," Gilkey advised Roosevelt. He wasn't alone in his concern. Even before the U.S. entered the war, a rising chorus of artists, scholars, museum curators, and humanities groups began pressing for the protection of vulnerable European art, architecture, and monuments. The president "thought it was a great idea," Gilkey recalled, but it would be years before anything came of it. With his World's Fair project completed, Gilkey turned to academia, securing his first postgraduate teaching appointment in 1939 at Stephens College in Columbia, Missouri, where he was determined to "bring printmaking to the heart of America." Within three years, Pearl Harbor had changed everything. Many faculty members were quickly pulled into the war effort. Gilkey volunteered for the U.S. Army Air Corps and was ordered to Texas to head the charts, maps, and aerial photography department for navigator and bombardier cadets. He eventually rose to become supervisor of instruction of an advanced navigation school. As war raged in Europe, Roosevelt began to address the threats to art and culture, assigning the matter to U.S. Supreme Court Justice Owen J. Roberts. In 1943, Roberts founded the American Commission for the Protection and Salvage of Artistic and Historic Monuments in War Areas, later known as the Roberts Commission. The only caveat: The work could not interfere with military operations. 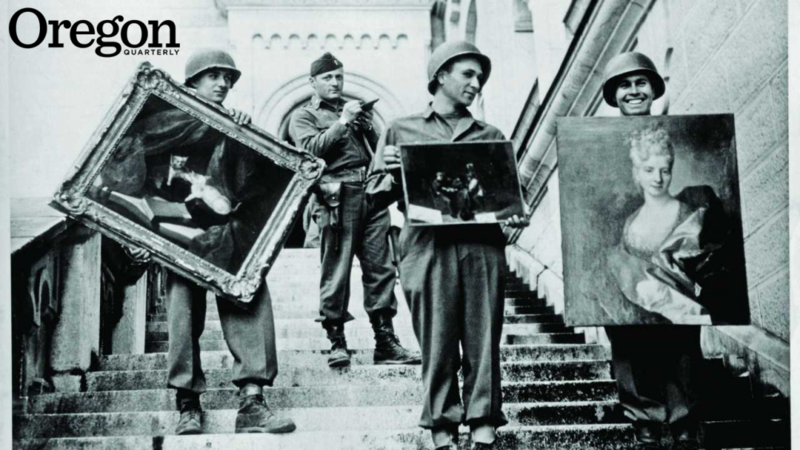 From the Roberts Commission emerged the Monuments, Fine Arts, and Archives (MFAA) Program, through which some 400 Allied service members and civilians (men and women, from 13 nations, known as the "Monuments Men") were assigned to protect historic and cultural treasures and repatriate artworks seized as the spoils of war. This was dangerous and uncharted territory. There was no blueprint for the task, no military history to reference. In fact, in the history of modern warfare, the charge to protect cultural treasures was unprecedented. From his stateside post, Gilkey hungered to be in the thick of it. The campaign to preserve artistic treasures that he'd once suggested was now finding a life: "By the summer of '44, as troops were moving across Europe . . . they started identifying people who could be pulled in as civilians in uniform to tell the bomber commands and ground forces what not to blow up," Gilkey recalled. "The few people (they recruited) had no logistic support, no typewriters, no jeeps. But they were there to advise the field commanders." His own transfer requests were repeatedly denied. Then, a possibility: combat intelligence officers were desperately needed. Gilkey pursued the required training, and as the war was winding down, he was on his way to a new assignment in Frankfurt, Germany, where the MFAA focus was shifting from protection and preservation to repatriation. 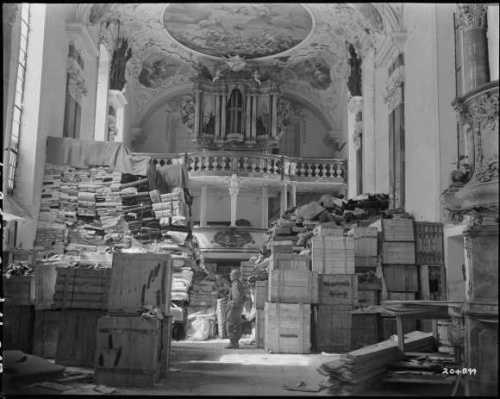 Protecting artwork during wartime was one thing; locating and returning it was an altogether different job. Gilkey joked about becoming an "art detective," but he relished the opportunity to help great artwork find its way home. Assigned to head the Department of War's special staff on art projects in Europe, he acted as a liaison between the U.S. military government in Berlin and various European governments. Finally serving in the role he'd long imagined, he led a unit that provided, as he put it, a "sort of clearinghouse" for coordinating the restitution missions of those eager to recover displaced museum properties and private collections. To this day, historians debate the sheer volume of artwork involved, but by most accounts it is staggering. German documents catalogue the seizure of some 4,000 paintings alone, including works by da Vinci, Cézanne, Manet, Raphael, and Vermeer. The Nazis had stashed stolen artwork throughout Germany and Austria, hiding it in castles and abandoned monasteries, bomb shelters and farmhouses. By 1939, a vast array of 10,000 pieces of art had been stowed in the Neue Burg, a part of the Imperial Palace in Vienna, according to Austrian records. Under the threat of Allied air raids, many objects had been relocated far from urban population centers, including remote tunnels within the Altaussee and Lauffen salt mines in Upper Austria—sometimes called "Europe's treasure vault." Records suggest the Altaussee mine alone harbored some 7,000 fine art pieces. Postwar, U.S. forces were charged with the safekeeping of these treasures—their collective value incalculable, their provenance sometimes murky. How to return them? That was the dilemma facing Gilkey as he arrived in Frankfurt, a city that still bore the fresh wounds of war. Working with various branches of the U.S. armed forces, his team began to pinpoint major repositories. The information Gilkey dealt with was often so sensitive that he didn't trust telephones, instead hand-carrying tips about secret caches throughout Europe. The job was also complicated by strict gas rationing, which made it hard to "get out and run things down." Gilkey coordinated raids with U.S. forces and sometimes with the local constabulary, and even aided in breaking up counterfeiting rings. Gilkey was also charged with hunting down a very different kind of artwork—Nazi war propaganda. At the height of the war, the German High Command had a staff of 80 artists focused on wartime propaganda. Gilkey ferreted out a major repository of their work, tracking it from Berlin to a wooded hillside on the border of Bavaria and Czechoslovakia in the Bayerischer Wald. "I found out what had been done, who had done it, and where it was through quite a lot of sleuthing," he said, eventually funneling more than 8,000 examples of propaganda and war art back to Washington, D.C. His efforts were intended to document—and help staunch—a revival of German militarism and contribute to a war department study on German psychological warfare. A few examples even found their way into his own ever-growing print collection. For Gilkey, the whole experience came to mean more than doing good work; it also helped him meet major artists and art collectors from around the world. For German artists, many of whom had been imprisoned under the Nazi regime, the postwar recovery was especially difficult. Art schools, galleries, and museums had been looted, and sometimes destroyed. Art supplies were not to be found. It was as if the war had brought much of the art world to a screeching halt. In the process of returning artwork, Gilkey often found himself facilitating the revival of museums, galleries, and art schools for Germany's reawakening artistic community. During the war, German expressionist Carl Hofer had been removed from his position as a professor at the Academy of Arts, Berlin, and imprisoned. Gilkey deliberately sought him out and personally helped persuade art academy administrators to reinstate him, along with a fellow professor, acclaimed German expressionist and printmaker Max Pechstein. The Nazis had also stripped Max Beckmann of his position at the Art School of Frankfurt. Beckmann had fled Germany in 1937 after hundreds of his modern paintings and prints were confiscated from German museums, many displayed in a "Degenerate Art" exhibition in Munich. Acting on a tip, Gilkey tracked down the artist, who was living in poverty in Amsterdam. Arriving on his doorstep unannounced, Gilkey urged him to apply for a university teaching position at Washington University in St. Louis. As always, Gilkey was hard to refuse, and Beckmann took the job. For his work, Gilkey received recognition from many of the European nations that he had aided. He was knighted by France and given high honors by Italy, Germany, and Sweden. The U.S. government awarded him the Meritorious Service Medal. Decades later, when Portland-based artist Morgan Walker, MFA '55, was taking his first printmaking classes from Gilkey, he would delight as the professor spun stories about those vibrant postwar years. "He knew all about German expressionist artists. He wanted to find them and he did," Walker recalls. "Gordon would appeal to Vivian to send over all the paper and ink that she could get her hands on to give to [artists] and then say, 'Get back to work.'" Working in postwar Europe had afforded contact with new and emerging artists, and Gilkey took full advantage, gathering even more drawings, etchings, and prints for his own collection. Some were signed "To Captain Gilkey," Walker recalls. "He was an incredibly generous man, a force of nature in many ways—but the collector was always there," says Walker, who now teaches printmaking at the Pacific Northwest College of Art in Portland. By 1947, Gilkey had amassed a large collection of prints and etchings by artists ranging from the 15th century to his own contemporaries: Picasso, Whistler, Chagall, Rembrandt, Goya, Renoir, Hogarth. Some were acquired through trades. Some were postwar bargains. Sifting through his collection, a visitor might find books from the private collection of Queen Victoria that had been a gift of appreciation from a German matriarch after Gilkey had helped relocate family jewels, or a rare series of Hogarth prints he'd snapped up at a London bookstore. A four-color lithograph by Toulouse-Lautrec was among only four known in existence: Gilkey owned one, as did the Louvre and the Metropolitan Museum of Art. Gilkey was still working overseas when he was hired to chair the Oregon State University Department of Art—a chance to teach printmaking to a new generation. In 1963 he was named the first dean of OSU's School of Humanities and Social Sciences, now the College of Liberal Arts, where he was a fiery advocate for the disciplines, working to create new majors and expand academic offerings. By the time he retired in 1977, his habit of trading prints had produced a full-fledged international collection featuring more than 15,000 pieces, most of which were stowed on shelves in the basement of his Corvallis home. An unapologetic graphic arts evangelist, Gilkey decided that his collection should be shared—preferably in a permanent home accessible to students, scholars, and the generally curious. After being wooed by several universities and museums, Gilkey chose the Portland Art Museum and donated about 8,000 prints in 1978—ultimately donating more than 14,000 objects. In 1993, the Vivian and Gordon Gilkey Center for Graphic Arts opened. Gilkey served as curator for the collection, while also teaching printmaking at the museum's school, the Pacific Northwest College of Art. He was eventually named professor and printmaker-in-residence. Even when he was well into his 80s, it wasn't unusual to see Gilkey wandering about the museum's graphic arts center with a stack of prints, each image accompanied by its own story. It was like reminiscing over old family photographs, images cherished and familiar. He loved them. And he wanted you to love them too. "There really wasn't an ounce of pretension in the man," recalls Sherwin Simmons, UO professor emeritus of early 20th-century art and design, who used to bring his art classes to study Gilkey's collection. "It was always an incredible pleasure to watch him working with students. He would lumber out like a great, friendly bear—quiet, but incredibly loquacious in a slow, halting way. He would pull out prints and start telling stories. The students were fascinated, and so was I." While Gilkey died in 2000, the collection—which today numbers about 21,000 graphic art prints and 6,000 photographs—is still among the most important print collections on the West Coast, says Bruce Guenther, chief curator at the Portland Art Museum. "What it says about the man is that he absolutely loved paper. He loved the printmaking process and he loved printmakers," Guenther says, noting Gilkey's role in building and nurturing a printmaking community in Portland that remains strong. "Graphic arts have always been an important part of the 20th-century vocabulary, and it was a vocabulary that excited Gordon," Guenther says. "He has, by the force of his larger-than-life personality and advocacy, helped so many people discover printmaking. "That is his real legacy." The story of the stolen artwork continues to evolve. Two years ago, 1,500 missing pieces—including paintings and prints thought to be originals by Picasso, Chagall, and others—were found in a squalid apartment in Munich. In October of this year, an investigation uncovered 139 pieces of stolen art (by Matisse, Klee, Kandinsky, and others) hanging in Dutch museums. The story will also come alive on the big screen this winter with the release of Monuments Men, featuring George Clooney and an all-star cast. Kimber Williams, MS '95, had the pleasure of interviewing Gordon Gilkey in 1994 and recalls his passion for printmaking, which was nothing short of infectious. Today, Williams covers faculty and staff news at Emory University in Atlanta, Georgia. Her most recent piece for Oregon Quarterly was "Long Journey Home" in the Winter 2012 issue.